We support Brent Council’s plans to improve the Granville and Carlton Centres. The plans, which were shaped by ideas and feedback from residents and community groups, will keep the original Carlton building and the main original part of the Granville building, and increase the amount of community space that the current Granville centre offers. The new community spaces will be of a much higher quality, more environmentally sustainable, fully sound-proofed, far more accessible to people with mobility needs, and of a quality that local people deserve for the long term. Since the South Kilburn Trust started running The Granville last May and opened it up to be accessible to everyone from the local community, we have had over 20,000 visits. We run a wide range of activities and events, the majority of which are free or very low cost to take part in. We offer resident discounts on spaces, which includes a special low rate for local community groups, including to Granville Community Kitchen. In fact all our prices are no higher than those charged at The Granville more than 10 years ago. We have had only one complaint of noise which was quickly resolved by moving the activity to a better room, and even if there is housing on site, we have housing right next door and have proved it can work well together. 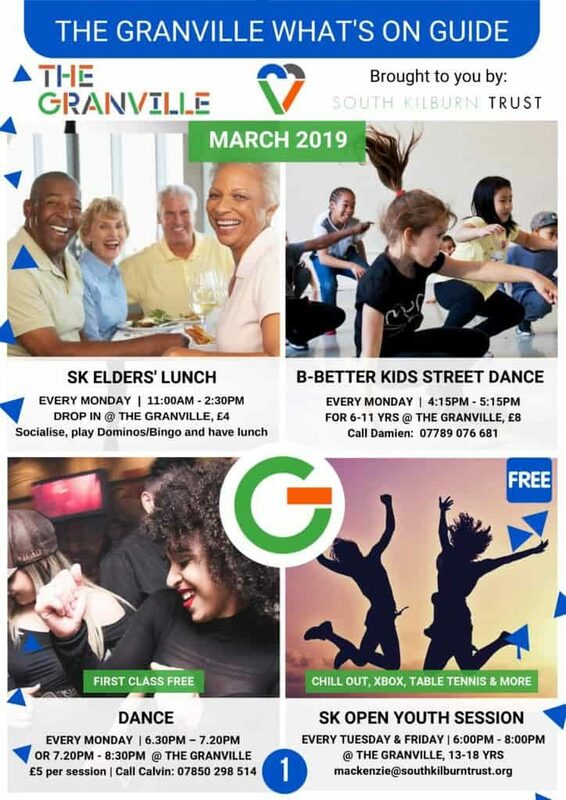 We have lots of great activities and events at The Granville in March. Check out the flyer below to find out more! The Granville is taking bookings for work and event space ahead of its opening in Spring 2018. The new-look Granville will boast brand new workspace and purpose built community and venue space for hire, following the completion of the refurbishment of the building this March. The Granville, a much-loved community building in the heart of South Kilburn, is currently undergoing refurbishment, due to re-open in spring 2018. The Granville will offer community space, workspace, and a café and garden, all open to local people. We are excited to announce that South Kilburn resident and founder of the Somali Community Group, Asha Shirwa, has been nominated for the ‘Community Champion’ Award at this year’s Pride of Brent Awards which will take place on Thursday 23rd November at the Brent Civic Centre. South Kilburn (SK) Family Fun Day ambassador, MC extraordinaire and community champion…these are just some of the things that South Kilburn resident, David Ellison is to local people.